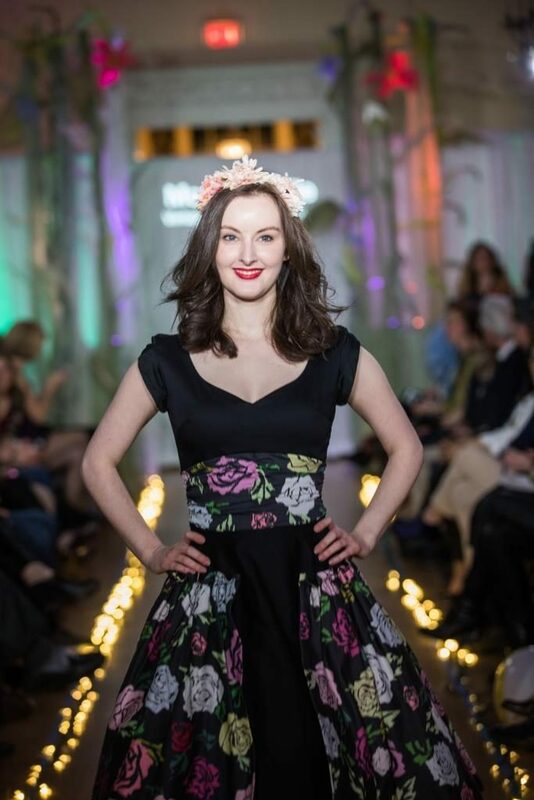 Join us for the sixth annual Salem Arts Festival Fashion Show Fundraiser – Friday, April 26, 7-10 pm – for a night of fashion, food, drink, and fun in support of one of Salem’s greatest festivals! The event is moving to a new location this year, the historic Hawthorne Hotel, at 18 Washington Square West. The one-of-a-kind event will feature fabulous fashions from renowned local boutiques and shops, including Curtsy, J. Mode, Lifebridge Thrift Shop, Modern Millie Shop, the Peabody Essex Museum Shop, re-find, The Boutique, Vampfangs, Beach Bride Baubles, RJ Coins & Jewelry, and Hive & Forge, as well as some final polish by local stylists Laura Lanes Skin Care and Rouge Cosmetics. Attendees can also expect outside-the-box accessories and surprises from local creative genius Grace & Diggs and other local makers from the Salem Arts Association on the catwalk. Karen Scalia of Salem Food Tours returns as the mastermind behind fashion show logistics and staging, and with festival co-organizers Salem Main Streets and Creative Collective at the helm, locals know it’s going to be an incredible night. The Fashion Show will tap into the 2019 Salem Arts Festival theme of “Roots.” Lighting and ambience by Retonica will completely transform the historic ballroom throughout the night. The 2019 Fashion Show Fundraiser is generously sponsored in part by Salem Five and Derby Square Architects. Advance tickets are $40 per person with a cash bar, tickets purchased the day of the event are $45 – but this event regularly sells out, so we don’t recommend waiting. VIP tickets are already sold out! Purchase tickets over the phone at 978-744-0004 x115, in person at 265 Essex Street (Salem Main Streets), or online at https://salem-main-streets.ticketleap.com/fashion-show-2019. Proceeds directly benefit the Salem Arts Festival. The 11th annual Salem Arts Festival will be held June 7th to 9th, 2019. SAF is organized by Salem Main Streets, the Creative Collective, and a collaboration of Salem organizations, including the City of Salem, Salem State University, Salem Food Tours, the Phoenix School, Peabody Essex Museum, the Salem Arts Association, and a significant number of dedicated locals. The festival also relies on the gracious support of its other creative partners, including Retonica Event Lighting, The Scarlet Letter Press, and Octocog Marketing and Design. If you would like to support this dynamic annual cultural mainstay for its 11th year, please contact kylie@salemmainstreets.org or visit www.salemartsfestival.com/support. Salem Main Streets mission is the continued revitalization of downtown Salem as a vibrant, year-round, retail, dining and cultural destination through business retention, recruitment, and the promotion of the downtown district. The Creative Collective connects creativity, community and commerce through a series of traditional and non-traditional marketing efforts, advocacy, events and resources. For more information about the Salem Arts Festival, please see www.salemartsfestival.com or contact Kylie Sullivan at kylie@salemmainstreets.org or (978)744-0004 (x115). Salem Maritime National Historic Site is affected by the government shutdown and is closed until further notice. A number of community members have been asking how to help or what they should know in the meantime, so local partners are working together to fill in the blanks. * Take a walk around the park and pick up litter. Some concerned community members have expressed interest in starting up a drive for grocery gift cards and other needs. Federal employees are not allowed to accept cash or gifts, so while the thought is greatly appreciated, please do not organize this type of event. Visitors in need of information should visit www.salem.org for an up-to-date list of what’s happening in town. For seasonal hours and information, please visit http://www.salem.org/seasonal-hours. * Please note there are no public bathrooms at either location. Information and needs will be updated as needed. Please send good thoughts for a prompt end to the government shutdown so that our colleagues can get back to doing their jobs of caring for the country’s first designated National Historic Site. Downtown Salem is a special place – home to top notch retail as well as an amazing restaurant scene, in a city full of rich history and local events for all ages. Salem Main Streets contributes a great deal to ensuring that downtown Salem remains a vibrant, year-round, retail, dining, and cultural destination. While Salem prides itself on having five seasons (winter, spring, summer, fall, and October), it takes a lot of thoughtful work to try to make sure that all twelve months of the year in downtown Salem are sustainable for our businesses, welcoming to our visitors, and mindful of our residents. This is why we need your help. Salem Main Streets continues to contribute a vast variety of services to the local community, but we feel like we could do so much more. Our nonprofit organization, and the community as a whole, would benefit greatly from us having the available funds to create an additional part-time staff position to complement our one full-time staff member, but that requires a jump in our organizational budget to be sustainable. It is also important to us that the majority of our events and services remain free to the downtown community. We estimate that every $100 donated to Salem Main Streets translates to roughly two hours of work invested into our local community. It may not seem like a lot, but with the added hours, a lot can be accomplished. Two hours is what it takes to set up the Salem Farmers’ Market every week before it is visited by over 2,000 eager consumers. Two hours is the length of our New Years Eve LAUNCH! event, where our community rings in the new year together at Old Town Hall. The 250+ local storefronts we serve are essential to the health of downtown Salem, so we try to spend a minimum of two hours every week checking in with them. We can get a lot done in two hours, but there never seems to be enough of them – imagine what we could do with more! Become a Friend of Salem Main Streets today with a tax-deductible donation. In addition to individual donations, SMS also has sponsorship opportunities to get your business in front of an engaged local audience. Sponsors can enjoy chatting about their services with shoppers at the Farmers Market, or hand out swag at the Ice Scream Bowl, or have an ice sculpture of their choice at Salems So Sweet. Recent collaborations, like working with our partners at Creative Collective on the Salem Arts Festival, mean that your sponsorship will be recognized more effectively to a broader audience than ever before. Find out more about becoming a sponsor! Your assistance and donations truly help bring Salem to life. 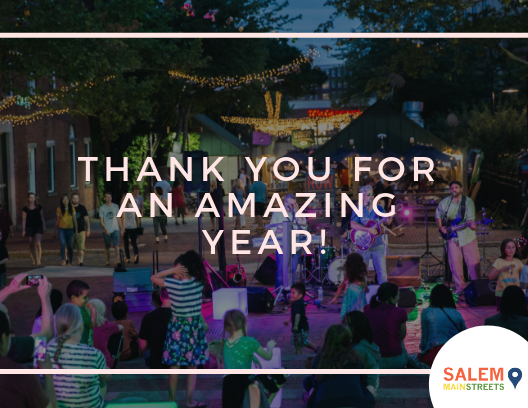 As we reflect on a great year and look forward to the next, it is more apparent than ever that our nonprofit is going to need more resources to keep impacting positive change in the downtown. Donating to SMS or sponsoring our work will help in the effort to keep our astonishing and unique downtown area vitalized for many seasons to come. Thank you for being a part of what makes our community so special. Downtown Businesses – Sign Up Today to Participate in Salem’s So Sweet! In celebration of the chocolate weekend, many of Salem’s finest restaurants may feature special chocolate offerings on their menus,including desserts, cocktails, and inventive sauces. Participating Salem retailers may take part with in-store events and promotions, displays and items geared toward chocolate and Valentine’s Day. A description of your promotion is listed in the brochure. The Golden Ticket 10% Promotion allows shoppers who make a purchase at one participating business to receive 10% off a full price purchase at any other participating business. Restrictions may apply as needed, and for restaurants, discounts can be for food only. This promotion will apply on Saturday, Feb. 9 and Sunday, Feb. 10 ONLY. This popular tasting event, which sells out every year, features wine, chocolate, and other sweet samplings from restaurants, gourmet food stores, and chocolate shops. We are looking for Salem restaurants /caterers to participate! Food must be prepared off-site. Each restaurant will want an opportunity to give people a taste,so please consider this when determining your portion/taste offering. (250 – 300+people). Please provide your own napkins, paper plates and utensils, and sanitizer solution. Promotional materials for your establishment, menus, catering, etc. are allowed. Set-up time is between 5:00-6:00pm. 2 cases of wine or equivalent recommended if bringing a beverage. Each restaurant is responsible for their own trash removal. A 6-foot long table and table coverings. Order an ice sculpture! Ice sculptures will be built around the downtown area of Salem to help increase foot traffic the weekend before Valentine’s Day. Make sure to get one near your business! We will coordinate the ice sculpture orders and themes with Ice Effects (contracted company) for you. Sculptures range from $460 to $875. We are lighting the sculptures at night on Saturday, Feb. 9, thanks to Retonica. We have multiple options to sponsor the festival and make your support visible to the thousands of locals and visitors who attend annually. Contact Rinus Oosthoek at rinus@salem-chamber.org or 978-744-0004 x116 for more information. The holidays are here, and Salem is dressed for the season with trees, wreaths, and ribbons. To top it off, over 30 downtown businesses have decorated their windows especially for the holidays. 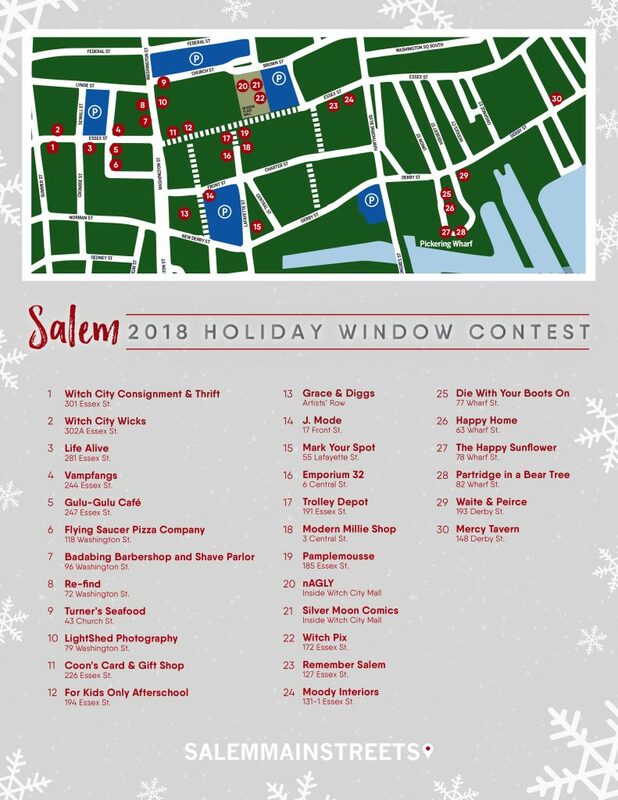 Judges nominated by Salem Main Streets made the rounds early this week to vote on the best windows. Some award categories highlight good retail design – use of store products or display of a business’ services – or types of design, like most traditional. The Contest Newcomer recognizes businesses with high quality displays who have not previously or regularly participated in the contest. A “Salem Main Streets Shout-Outs” category was also created this year for businesses that ended up on several judges’ final lists and were deserving of recognition. A full set of images can be found online at https://bit.ly/2AZDaRJ.